NOTE: Clicking on any of the many links provided in this collection will take you to an article that provides a response or analysis of the particular claim or issue. Many of these articles have extensive collections of articles and reference materials. Currently, the Islamophobia Industry is engaged in a full-scale, coordinated, demonization campaign against American Muslims and Arabs. 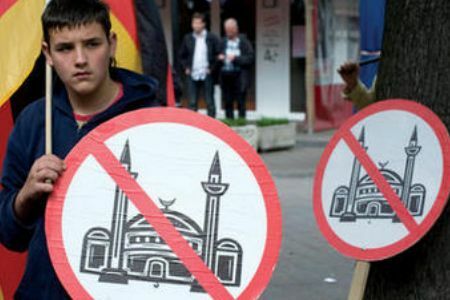 In just the past few months we have seen a series of inflammatory provocations: There was the Innocence of Muslims film Titanic, a German satire magazine plans an “Islam” cover article to be published later this month. Charlie Hebdo, a French satire magazine published an issue with inflammatory cartoons of the Prophet Muhammad. Newsweek published their ‘Muslim Rage’ cover. Terry Jones held a “trial of Prophet Muhammad”. SION held a “global” gathering in NYC to plan propaganda strategy. A group in Toronto publicized a “walk your dog at the mosque” day. AFDI/SIOA has run a series of anti-Muslim ads on public transportation across the country. AFDI/SIOA are planning to run 8 more anti-Muslim ads. There are three more films on Prophet Muhammad in the works by Ali Sina, Mosab Hassan Yousef and Imran Farasat. Daniel Pipes is encouraging publication of “A Muhammad cartoon a day”, and says “So, this is my plea to all Western editors and producers: Display the Muhammad cartoon daily, until the Islamists become accustomed to the fact that we turn sacred cows into hamburger.”. Pipes joins Daniel Greenfield (aka Sultan Knish) who published an appeal on David Horowitz’ Front Page Magazine Is It Time for ‘Make Your Own Mohammed Movie Month’?.